Jesus said to the chief priests and the elders of the people : ‘The kingdom of heaven may be compared to a king who gave a feast for his son’s wedding. He sent his servants to call those who had been invited, but they would not come. Next he sent some more servants. “Tell those who have been invited” he said “that I have my banquet all prepared, my oxen and fattened cattle have been slaughtered, everything is ready. Come to the wedding.” But they were not interested: one went off to his farm, another to his business, and the rest seized his servants, maltreated them and killed them. The king was furious. He despatched his troops, destroyed those murderers and burnt their town. Then he said to his servants, “The wedding is ready; but as those who were invited proved to be unworthy, go to the crossroads in the town and invite everyone you can find to the wedding”. Big problem with this story. But a good story of Jesus always raises a question. It seems a bit unfair to be thrown out having been brought in at the last minute because you had no garment. The garment means you want to be there, are there willingly and able to take on the values of the feast. The garment is the desire of the heart to be a follower in name and deed. 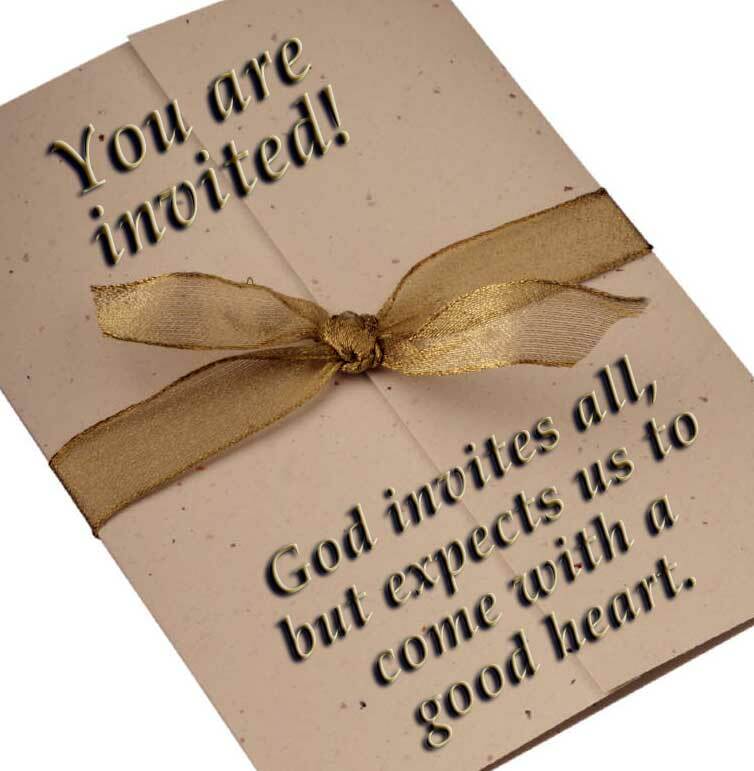 God invites all, but expects us to come with a good heart. What that might mean – look at our desires. Often we see people around Mass who seem not to respect it. They may not come often etc…but God looks to the heart. While he is totally the inviting one, he wants us to be with him. The heart that follows is the heart that wants to pray, to want to do good, to love,…every loving heart is a heart from God and that is the wedding garment. All comes back to love in the end. The garment was love in the heart – willingness to be there – and when that was not there, the story took that turn. Costly grace. The man knew he should not be there in his heart. Jesus sees into the heart. Not just into what we do. Like sometimes people put on the religious show for baptism or a wedding now, or come to a Mass. What we look for is the sincerity in what brings them and that can be different for different people. Religion is firstly of the heart and then practice. We never know what’s in the heart of our people who come sometimes in faith. Let God be the judge of that! This entry was posted in Gospel of Matthew, Gospel Reflection, Liturgy Resources, Prayer Resources, Scripture and tagged Donal Neary SJ, God invites all, Gospel Reflection, Heart, Jesus, Kingdom of God, Love, Matthew 22:1-14, October 12th 2014, parable, Sunday Gospel and Reflection for 12th October 2014, Sunday Scripture and Reflection for 28th Sunday Ordinary Time Year A, wedding feast, wedding garment.